If you want to stay and enjoy a great night’s sleep, No problem! If you want to stay and enjoy a great night’s sleep, No problem! 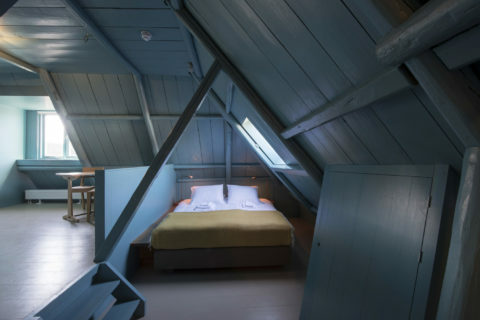 Under the wooden beams of the ancient building, Omke Jan’s guests have a choice between three spacious guest rooms and an atmospheric studio. Piet Hein Eek balanced the comfort of contemporary design with the timeless character of the old farmhouse. Come and relax between the meadows, and enjoy panoramic views over the water and village the following morning. The top floor at Omke Jan has three attractive double rooms. 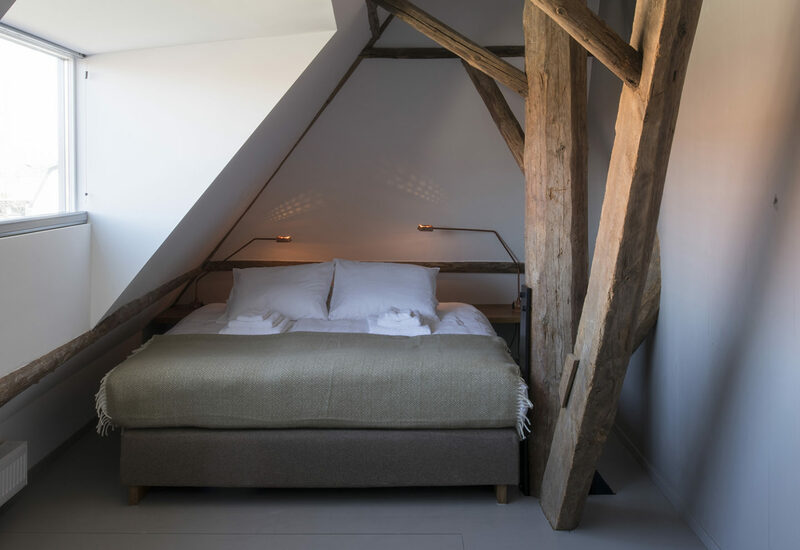 These beautiful rooms, which were designed by Piet Hein Eekeach, feature soft beds with luxurious bedding, and a private bathroom with walk-in shower and toilet. A cot is available on request. The studio is for those wanting a bit more space. In addition to a luxurious double bed, the studio also has a kitchen unit, fridge, coffee and tea making facilities, a modest dining area, and a cosy sofa. It’s perfect for longer stays. Breakfast is optional for the extra price of €12.50 per person. A cot or bed for toddlers can be placed in the rooms for €10,-. Tourism tax of €1,25 p.p.p.n.